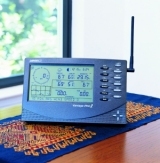 The weather station used to generate the data is a Davis Vantage Pro2 wireless station. (as shown ). It includes a wireless display unit that receives data from an anemometer mounted on the roof, an outdoor temperature, humidity sensor and rainfall gauge. This data is fed into a computer running Virtual Weather Station V13.01 The data is logged using this software and graphs are created similar to those displayed on this website. A database collects the raw data every 15 minutes and adds it to a history table for querying at a later stage. Virtual Weather Station then sends graph updates to this webpage every 15minutes and raw data updates every 5minutes with the latest data.